The people of the interwebs are so darn crafty! Here’s a couple of ideas, I thought would be fun to DIY. I’m a girl and I love anything with tulle and these tulle socks from Shinetrimblog are just righteous! If you can sew a little you can make yourself a pair of these bad boys. Click here for the tutorial. You could totally rock this chain headband from the love Meagan blog, stand out at the beach or an outdoor concert. Yep. Click here to see how to do it. 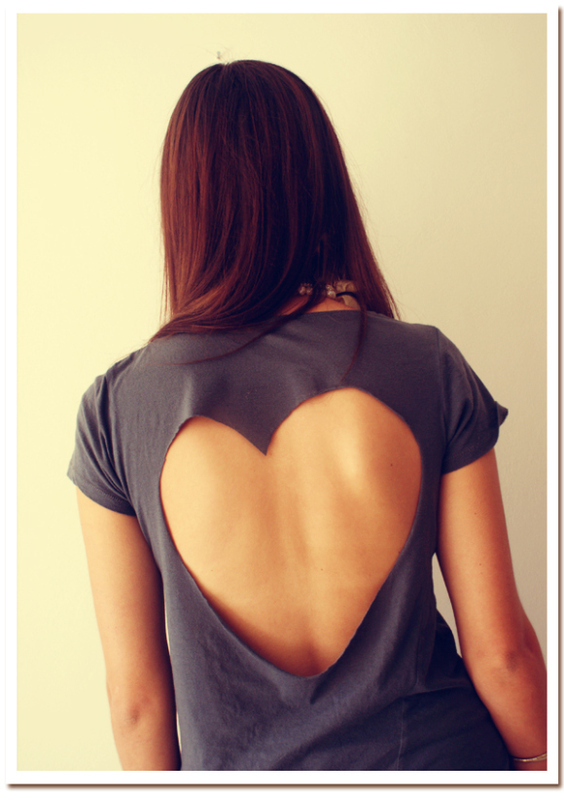 Simple heart cut out tee from the made in pretoria blog. This would be real cute over your swimsuit and it takes about 5 minutes to make. Click here to make yourself one. I love, love this idea. It comes from the chick at alittle glass box blog. 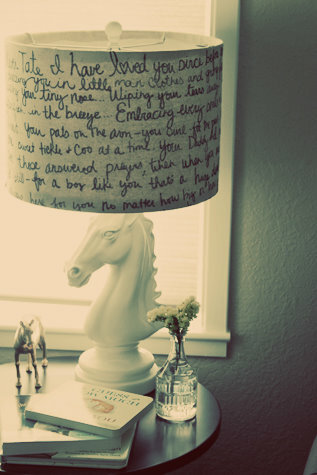 She wrote a letter to her son on a piece of linen material and then covered a lampshade with it for his room. This is a super cool idea for a kids room or nursery. Would also be awesome for an Anniversary present, Valentines day, a newly married couple setting up house or your boyfriend. You could write your vows on it, your favorite poem, a love letter or any ole thing you feel like. Beautiful. Got any great ideas…share them and don’t forget to subscribe! ← Juliette Has A Gun: Not A Perfume…Well, What Is It?